Waterside Winery — Nestled on the meandering banks of the picturesque Shuswap River; Waterside Vineyards and Winery is a family owned and operated winery producing hand crafted, cool climate wines. Baccata Ridge — north of Enderby tucked into the hills on Monk road off of Highway 97A, Baccata Ridge pours organically grown red and white wines including Foch, Blueberry Reserve and Pinot Noir. The Shuswap Highlands surrounding Enderby may be best known for its wide open pastures, lazy river and rolling mountains, but you may be surprised to know, this same lush landscape with its unique micro-climate is home to the newest cash crop…grapes! Taste vintages from the northern most reaches of BC’s wine region and you’ll be drinking up plenty of reasons to return! Just outside the City limits you will feel like your in a different world, get lost exploring beatiful seniory of the vineyard and the prestine Shuswap River. Owners of the winery have the commitment of the highest quality wines, outstanding values, and time honoured traditions. Enjoy the tasting room, patio seating and picnic area, gift shop and take a self guided tour. Sip on Siegerrebe, Pinot Gris, Viognier, or Gewurztraminer at this hidden gem. 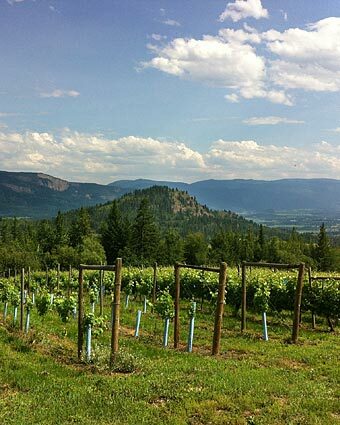 Just north of Enderby at Baccata Ridge Winery just off Highway 97A in Grindrod, the vineyards and blueberry patch are situated on steep, south-west facing slopes, and the mineral rich soils ensure high quality fruit production. While the winery has been in production for the past twelve years, it was taken over by the Robertson family in September of 2016. We are a family with a strong agriculture background excited to bring an upbeat atmosphere and experience. To learn more and see what the North Okanagan is all about, come visit us at our small but charming rustic taste cabin. Their wine is expressive of the unique terroir in which it is grown, and care is taken in ensuring a healthy balance and respect towards the ecosystem that surrounds the vineyard is apparent in every sip you enjoy. Follow the rural back roads past stands of larch and cottonwood trees and you’ll reach the northern most edge of BC’s wine region and Larch Hills Winery. The lush, green landscape of the Shuswap Highlands drew winemakers Jack and Hazel Manser to the area where they bought, then expanded, the south-sloping vineyard. Sipping wine is elevated here, where at 700 metres above sea level Larch Hills has the distinction of being the highest elevation vineyard in North America. Jack and Hazel are happy to share their journey to winemaking with you while you sample their award-winning Ortega, one of the first vintages ever bottled and one BC’s best dry, crisp and fruity wines. The Mansers grow only European varietals like Siegerrebe, Madeleine Angevine, St. Laurent and Lemberger grapes that thrive particularly well in our northern climate. The valley views from the tasting room deck are almost as heady as the wines. Bring a picnic and enjoy a bottle, or, better yet, bring an empty crate for your purchases…Larch Hill wines are some of the best-valued wines in all of BC. The tasting room is open daily, but in the winter, it’s a good idea to call ahead! Enderby has additional amazing wineries in surrounding communities heading South look for Lavina Estate Winery, Edge of the Earth Vineyards, and Ovino Winery. Head West and you will find Sunnybrae Winery and Recline Ridge Vineyard and Winery.